Adventures with Jude: Five Minute Friday: What Mama Did. 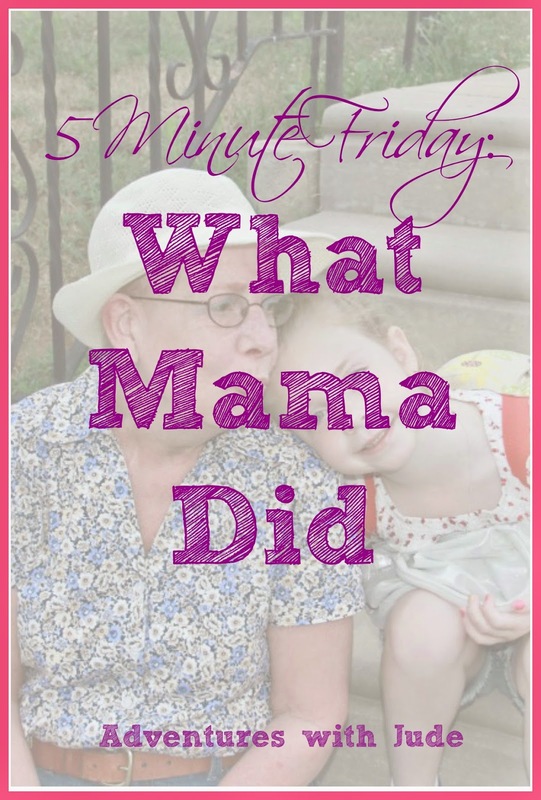 Five Minute Friday: What Mama Did. Today's Five Minute Friday topic: What Mama Did. What did your mother do that makes her special and yours. It's not what my Mother did, but what she didn't do. She didn't blink. I said to her, "I know it's your night out with Gram, but we need you to come home. [My younger brother] Matthew needs stitches." She packed up her things, came home, and went to the ER. Once there, she held his head in her lap so the doctor could patch his chin back together. I said to her, "I'm bored. Can I dye my hair purple?" so many times when I was a teenager that she rolled her eyes and said, "Whatever you want, dear." The weekend I came home from summer camp with hair the hue of a Lenten chasuble she raised an eyebrow and shook her head, but didn't say a word. I said to her, "I want to change schools. I don't like where I am, and I want to come home. And I want to change majors. I don't want to be pre-med, I want to study theater." She threw another chicken leg in the oven, welcomed me back home, and came to see me perform. I said to her, "I want to get married," and she didn't say "You've only known him four months!" or "You're too young!" She just said, "When?" and we planned my wedding while riding the El to work. I said to her, "I'm pregnant," with baby no. 5, and she said, "As long as you're both OK, I'm happy." Of course she worried, but she never said "Five???!!" She just said, "I'll keep praying," and she finished the baby quilt HER mother started before she died, so that Damien would have one just like all of the other babies. I said to her, "What can I do to help?" 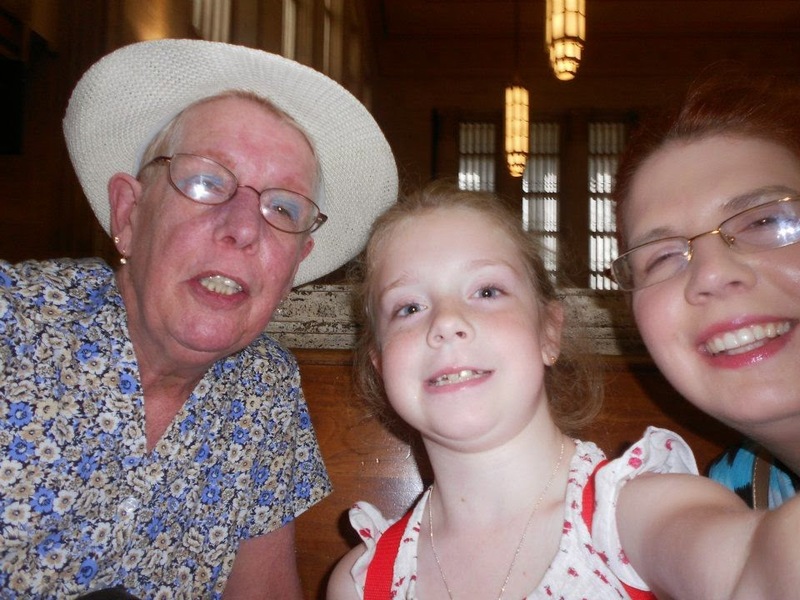 when she was diagnosed with cancer for the second time in three years. She said, "Come help me pick out hair." So I did, and eventually she chose three wigs -- her "everyday" hair, her "good" hair, and her "party" hair. Bald didn't stop her. People say, "Don't blink, you'll miss it." She doesn't miss anything. She doesn't blink. and we decided to go "all in" and head to New York City. Oh Meg, she sounds like a wonderful mom. Sweet picture.